Abay was born in what is today the selo of Karauyl, in Abay District, East Kazakhstan Province; the son of Qunanbay and Uljan, Qunanbay's second wife, they named him Ibrahim, but because of his brightness, he soon was given the nickname "Abay" (meaning "careful"), a name that stuck for the rest of his life. His father's economic status enabled the boy to attend a Russian school in his youth, but only after he had already spent some years studying at a madrasah under Mullah Ahmet Ryza. At his school in Semipalatinsk, Abay encountered the writings of Mikhail Lermontov and Alexander Pushkin. The leaders of the Alash Orda movement saw him as their inspiration and spiritual predecessor. Contemporary Kazakh images of Abay generally depict him in full traditional dress holding a dombra (the Kazakh national instrument). Today, Kazakhs revere Abay as one of the first folk heroes to enter into the national consciousness of his people. Almaty State University is named after Abay, so is one of the main avenues in the city of Almaty. There are also public schools with his name. The Kazakh city of Abay is named after him. Among Abay's students was his nephew, a historian, philosopher, and poet Shakarim Qudayberdiuli (1858–1931). Statues of him have been erected in many cities of Kazakhstan, as well as in Moscow. Abay also translated into Kazakh the works of Russian and European authors, mostly for the first time. Translations made by him include poems by Mikhail Lermontov, Johann Wolfgang von Goethe, Lord Byron, Ivan Krylov's Fables and Alexander Pushkin's Eugene Onegin. 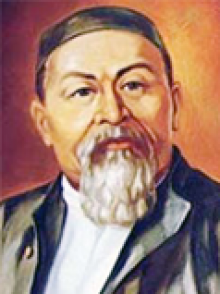 Abay's major work is The Book of Words (Kazakh: қара сөздері, Qara sözderi), a philosophic treatise and collection of poems where he encourages his fellow Kazakhs to embrace education, literacy, and good moral character in order to escape poverty, enslavement and corruption. In Word Twenty Five, he discusses the importance of Russian culture, as a way for Kazakhs to the world's cultural treasures.